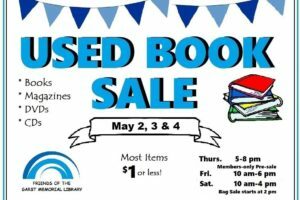 Join our Friends as they host the best book sale in Webster County. Be sure to sign up to be a member before Thursday May 2nd so you can shop the early members-only pre-sale. The sale will be held at the Central Bank of the Ozarks Community Room at 1197 Spur Dr.
Saturday may 4th 10am- 4pm Bag sale begins at 2pm.